COLLEGE STATION, Texas – Georgia women and Virginia Tech men head into Saturday’s second and final day at the 2018 NCAA Division I Indoor Championships with the lead. At the end of the Day 1 action on Friday night inside Gilliam Indoor Track Stadium in College Station, Tex., Georgia tallied 33 points after 6 out of 17 finals were contested on the women’s side. Junior jumper Kate Hall, the 2017 NCAA outdoor long jump champion, led the way with a school record of 6.73m and piloted a 1-2-3 historic finish in the women long jump for the Lady Bulldogs. Keturah Orji was second with Tara Davis taking third place with a personal best. 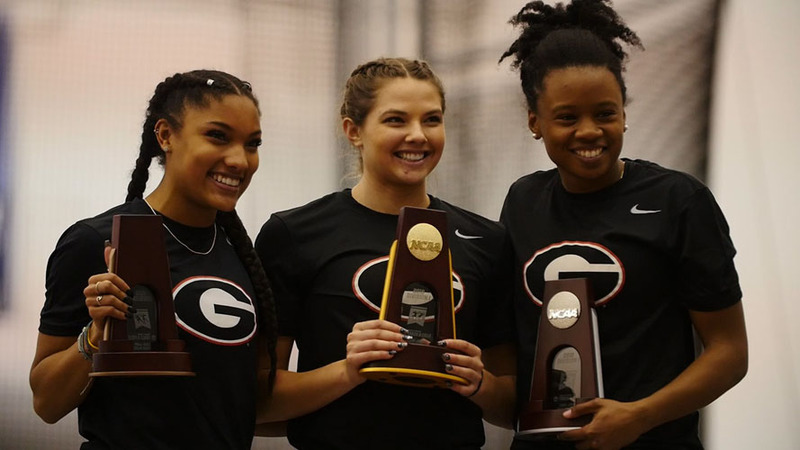 “Our finish in the long jump was unbelievable and I am so proud of those three for answering the call,” said Bulldog head coach Petros Kyprianou. Florida finished the day in second place on the women’s side with 13 points, with New Mexico (12pts) in third and Stanford (11pts) sitting in fourth. Four teams are tied on 10 points, including Oregon and Arkansas. On the men’s side, Virginia Tech holds a slight half-point lead, but those below them are all in contention to pounce on the final day. Leading the way for the Hokies was the men’s distance medley relay team, which grabbed the national title with a time of 9 minutes, 30.76 seconds. The win helped Virginia Tech ended the day with 16 points, half-point more than Texas A&M, which is on 15.5 points after 5 out of 17 finals were completed. Alabama and Florida followed next with 11 points each, with three teams, Colorado State, Syracuse and Kansas all locked on 10 points.